Alternative Sweetener. Ingredients: 100% Pure Xylitol. No additives. Xylitol is a sugar substitute that is suitable for Diabetics and slimmers. Although just as sweet as sugar, it has about 40% fewer calories and 75% fewer carbohydrates. Xylitol is slowly absorbed and metabolized, resulting in very negligible changes in blood sugar and insulin levels. Suggestions: Use as a sweetener in drinks, tea/coffee, cereals, porridge, cooking, and baking. 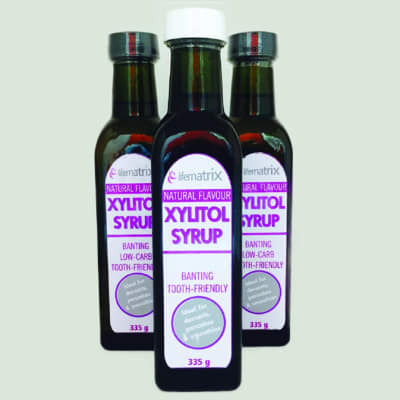 1tsp of Xylitol=1tsp of sugar with regard to the sweetness. 300tablets. Stevia is a sugar alternative that is extracted from the leaves of stevia plant. Improved taste. Smaller tablets. Sweetener. Ingredients: Lactose monohydrate, steviol extracts(95% steviol glycosides)(non-nutritive sweetener), croscarmellose, magnesium stearate. To use: As a sugar alternative, replace 1 teaspoon sugar with 1-2 stevia tablets. Dissolve in your in your favourite hot beverage. Typical Nutritional Information. Single serving size=50mg(1tablet) As Packed Per 100g Per single serving Energy(Kj) 960 0 Protein(g) 0.0 0.0 Glycaemic Carbohydrate(g) 60 0 of which total sugars(g) 59.8 0.0 Total fat(g) 0.0 0.0 of which saturated fat(g) 0.0 0.0 Dietary fibre(g) 0.0 0.0 Total sodium(mg) 0 0 Suitable for Diabetics and Hypertensive diets. Sweetener suitable for diabetics, for slimmers and vegan-friendly. Ingredients: Purified water, steviol extract (95% steviol glycosides) (non-nutritive sweetener), potassium sorbate, citric acid. Sweetener suitable for diabetics, for slimmers and vegan-friendly. 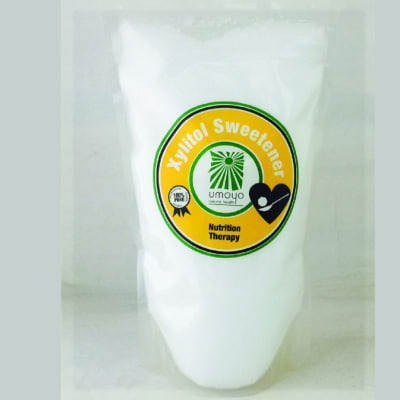 This herbal liquid sweetener is extracted from the leaf of the stevia plant, a South American herb. It has an intensely sweet, smooth taste. Directions for use as a sugar substitute: replace one teaspoon of sugar with 6 drops of stevia liquid. This liquid can be used in drinks, cooking and baking. It is 25-30 times sweeter than sugar and should be used sparingly. Herbal Sweetener. Suitable for Diabetics & Slimmers. Stevia is an intensely sweet herbal sweetener that is extracted from the leaf of the stevia plant. Ingredients: Steviol extract(non-nutritive sweetener). To Use: As a sugar substitute, replace 1 teaspoon sugar with a knife tip of stevia powder. Typical Nutritional Information Single serving size=20mg(knife tip) As Packed Per 100g Per single serving Energy(Kj) 15 0 Protein(g) 0.0 0.0 Glycaemic Carbohydrate(g) 0 0 of which total sugars(g) 0.0 0.0 Total fat(g) 0.0 0.0 of which saturated fat(g) 0.0 0.0 Dietary fibre(g) 0.0 0.0 Total sodium(mg) 0 0 This product is packed in a warehouse where peanuts and tree nuts are present. Unbleached. Unrefined. Made by tapping the nectar of the coconut palm blossom and then evaporating the moisture. The result: a delicious, 100% natural sugar. Typical Nutritional Information Serving size. 5g-1 Teaspoon (ready to eat) As packed Per 100g Per serving Energy(kj) 1546 77 Protein (g) 0 0 Total carbohydrates (g) 92.3 4.6 of which total sugar (g) 92.3 4.6 Total fat (g) 0 0 of which saturated fat (g) 0 0 Dietary fibre (g) 0 0 Total sodium (mg) 0 0 Why Use It? Nutrient Content Coconut sugar isn’t a nutritional superfood, but it does offer more vitamins and minerals than white table sugar. It contains trace amounts of vitamin C, potassium, phosphorous, magnesium, calcium, zinc, iron and copper. 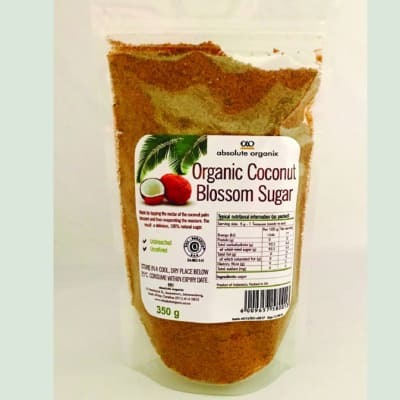 Coconut sugar also provides small amounts of phytonutrients, such as polyphenols, flavonoids and anthocyanidin, and antioxidants. You’ll also find the B vitamin inositol, often used as a mood booster, in coconut sugar. Low Glycemic Impact The glycemic index measures the effects of carbohydrates on your blood sugar. Coconut sugar ranks just 35 on this index, while regular table sugar ranks between 60 and 75. Foods high on the glycemic index cause your blood sugar to spike, which can lead to a sugar rush and subsequent crash. Fast spikes in blood sugar can also cause your insulin levels to soar in a short period of time, and this can have serious consequences for diabetics. 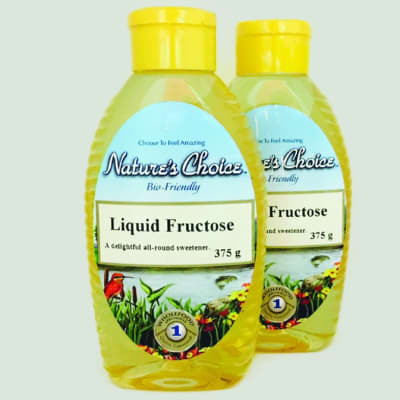 Less Fructose Fructose is a type of sugar your body converts to fat quickly. Only your liver can break down fructose, and one of the results of this breakdown is triglyceride — a form of fat. You shouldn’t consume large amounts of fructose outside of that which you get in fresh fruit. Coconut sugar has just 45 percent fructose, making it a better option than these other sweeteners. Earth Friendly The trees use minimal amounts of water and fuel, especially compared to sugar cane production, and produce for about 20 years. It has no artificial ingredients and is not chemically altered in any way. This clear syrup is produced from the Agave Salmeana plant. It is 30% sweeter than honey. Agave syrup can be used as a sugar or honey alternative. 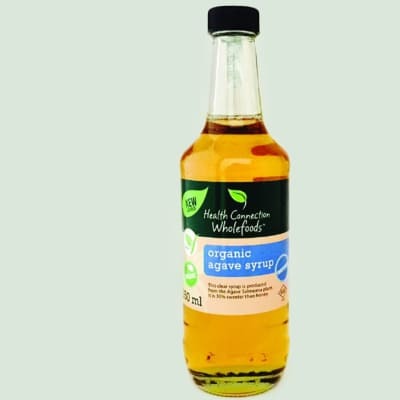 Delicious drizzled over porridge, cereal or pancakes or added to hot or cold drinks. Also excellent for use in cooking or baking. TYPICAL NUTRITIONAL INFORMATION Single serving size=20g( 1 tablespoon) As Packed Per 100g Per single serving Energy (kj) 1666 333 Protein (g) 0.0 0.0 Glycaemic carbohydrate(g) 93 19 of which total sugar(g) 93.0 18.6 Total fat(g) 0.0 0.0 of which saturated fat(g) 0.0 0.0 Dietary Fibre(g) 0.0 0.0 Total Sodium(mg) 0 0 This Product is packed in a warehouse where peanuts and tree nuts are present.